Gloucestershire is a county in South West England split into three areas, the major part of the Cotswold Hills, part of the flat fertile valley of the River Severn and the entire Forest of Dean. It borders with the counties of Gwent in Wales to the west, Herefordshire to the northwest, Worcestershire to the north Warwickshire to the northeast, Oxfordshire to the east, Wiltshire to the south and Bristol and Somerset to the southwest. Gloucestershire’s county town and only city is Gloucester and has 32 towns. The charming Cotswolds villages and towns and quaint cottages and buildings gained much of their character from the yellow limestone that was quarried locally. The area was once entirely dependent on sheep farming and many of the fine churches and manor houses owe their existence to the generosity of the wealthy medieval yeoman farmers and wool merchants. The valley of Britain’s longest river, the River Severn, is flat with lush meadows along its banks and is famous for its tidal bore. The views across the River Severn are outstanding and its estuary is a haven for wildfowl and wading birds. The Royal Forest of Dean sits between the Wye Valley, the Vale of Leadon and the Severn Valley and is one of England’s few remaining ancient forests. Covering 27,000 acres it was designated as a National Park in 1938. Full of magic and mystery the forest has been the inspiration for many great artists and writers including JRR Tolkien and JK Rowling. The Cotswolds are a range of hills covering an area of 25 miles across and 90 miles long and lie mainly within the counties of Gloucestershire and Oxfordshire but extend into parts of Wiltshire, Somerset, Worcestershire and Warwickshire. The spine of the Cotswolds runs southwest to northeast through the six counties particularly Gloucestershire, west Oxfordshire and south western Warwickshire. The Cotswolds have been designated as the Cotswold Area of Outstanding Natural Beauty and is the largest AONB in England and Wales. The northern and western edges of the Cotswolds are marked by steep escarpments down to the Severn Valley and the Warwickshire Avon and this escarpment is often called the Cotswolds Edge. On the eastern boundary lies the city of Oxford and on the west is Stroud. To the southeast the upper reaches of the Thames Valley and towns such as Lechlade, Tetbury and Fairford mark the limit of this region and to the south the boundary reaches beyond Bath and towns such as Chipping Sodbury and Marshfield. The Cotswolds are characterised by attractive small towns and villages built of the underlying Cotswold stone, a yellow limestone, and drystone walls many built in the 18th and 19th centuries can be seen everywhere in the fields. The most well known towns or villages are Bourton-on-the-Water, Broadway, Burford, Chipping Norton, Cirencester, Moreton-in-Marsh, Northleach, Stow-on-the-Wold, Stroud and Winchcombe. During the 13th – 15th centuries the native Cotswold sheep were famous throughout Europe for their heavy fleeces and high quality of wool. Cotswold wool came at a high price and the wealth generated by the wool trade enabled wealthy traders to leave their mark by building fine houses and beautiful churches, known as “wool churches”. Today the sight of the sheep on the hillside is still one of the most common features of the Cotswolds. Stow-on-the-Wold is a small market town situated on top of an 800 ft hill at the convergence of a number of major roads and was founded as a planned market place by Norman lords. Maugersbury was probably the primary settlement before Stow was built to take advantage of passing trade on the busy crossroads. Fairs have been held in the square by royal charter since 1330 and their aim was to establish Stow as a place to trade. As the fairs began to grow and become popular the town prospered and started dealing not only in livestock but in many handmade goods and the wool trade also played a large part in the area. When the wool trade declined horse trading took over and horses would be sold at every fair. The annual horse fair is still held today but has been relocated to a large field on the edge of the town close to Maugersbury rather than in the square. Stow-on-the-Wold is a small market town situated on top of an 800 ft hill at the convergence of a number of major roads and was founded as a planned market place by Norman lords. Maugersbury was probably the primary settlement before Stow was built to take advantage of passing trade on the busy crossroads. Fairs have been held in the square by royal charter since 1330 and their aim was to establish Stow as a place to trade. As the fairs began to grow and become popular the town prospered and started dealing not only in livestock but in many handmade goods and the wool trade also played a large part in the area. When the wool trade declined horse trading took over and horses would be sold at every fair. The annual horse fair is still held today but has been relocated to a large field on the edge of the town close to Maugersbury rather than in the square. Bledington is a very pretty village about four miles south east of Stow-on-the-Wold within the Cotswolds Area of Outstanding Natural Beauty and is close to the Gloucestershire-Oxfordshire boundary. 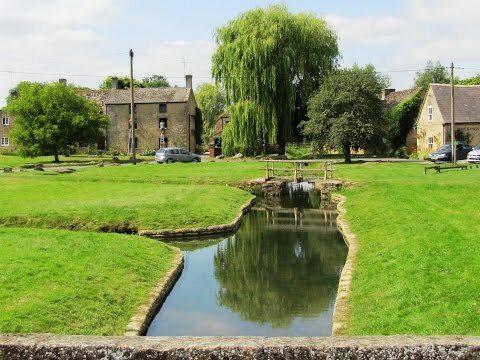 The village which lies on the River Evenlode and also on the Oxfordshire Way has a large village green with a maypole and a little wooden bridge over the river. Bledington won the Community category of the ‘2004 Calor Gloucestershire Village of the Year’ and in 2012 the village won the Most Resilient Community category of the Gloucestershire Rural Community Council Vibrant Village Awards. The 16th century Kings Head Inn, originally built as a cider house, which overlooks the green was awarded Dining Pub of the year by the Good Pub Guide in 2001 and Bledington Primary School which was awarded ‘Outstanding’ by OFSTED in 2011 puts it in the top 9% of primary schools nationally. The annual Bledington Music Festival, established in 2000, is held over three summer evenings in June and features top class performers from all over the world. The village shop closed in 2006 but the Post Office part continues in the King’s Head two mornings each week. Pending planning permission the Bledington Shop Committee is trying to re-establish a community shop in the village. The Church of England parish church of St. Leonard dates back to the late 12th century. The River Evenlode a tributary of the River Thames in Oxfordshire rises near Moreton-in-Marsh and flows south-east through many villages passing near Stow-on-the-Wold, Charlbury, Bladon and Cassington. The river, largely privately owned is used for fishing and leisure activities, joins the Thames about a mile down river from Cassington on the reach above King’s Lock three miles north-west of Oxford. Church Westcote and Nether Westcote are two beautiful villages close to each other situated south-west of Bledington and about 4 miles south-west of Stow-on-the-Wold. The parish of Westcote is also within the Cotswolds Area of Outstanding Natural Beauty close to the Gloucestershire-Oxfordshire boundary and overlooks the Evenlode valley. There are two churches within Westcote the Parish of St. Mary the Virgin, Church Westcote and the Methodist Church in Nether Westcote. Nether Westcote is home to The Feathered Nest Country Inn. From August 2009 the Inn, once an old Malthouse, underwent a year of re-building, refurbishing and updating to restore it to its original beauty. The Gloucestershire Way is a 100 mile long distance footpath using existing Rights of Way from Tutshill just north of Chepstow it crosses the River Severn at Gloucester and then continues to Tewkesbury with a Worcestershire Way link. From Bledington village green with the pub on our right we head forward up the lane on the Glocestershire Way past the houses and the church. At the end of the church wall we turn right and follow the path through the graveyard and then to the end of the field. We go through the gate and head forwards to end of the next field, cross over the little beck and turn left. We make our way across the field, go through a gate and keep heading forwards through a second gate. After a short way we turn left through the gate with a blue arrow over Westcote Brook. We soon come out into an open field and head forwards turning left at the blue arrow on a post. We continue through two large fields until we come to a crossroads of paths and a post with blue and yellow arrows. We turn left walking downhill between two hedges. After crossing over the beck we walk to the left of two posts slightly uphill through the trees. When we come out of the trees we cross over the field via the stiles. We come out at the field at the side of the house and head forwards to the track. We turn right towards the road then turn left along the back road of Church Westcote. We pass the church and the post box then bear left at the t-junction. We follow the road to Nether Westcote and bear left at the sign post for Methodist Church. We pass the pub then at the right hand bend in the road we turn left onto the track at the side of a white building. We head forwards slightly downhill for a couple of hundred yards then turn left through the hedge and turn right following the path to the pond. (You can keep following the track it will bring you out to the same place.) At the pond we go over the stile and head forwards through the field then cross over a little stream and just keep following the path through the trees until we come to an open field then walk between the two hedges until we come to some arrows on a post. We walk to the right of the post between the hedges then after a short way we go through the round gate on the right and turn left. We cross over a little bridge and keep heading forwards soon coming out into a field. We head forwards to the hedge line cross over a little bridge and turn right. We now retrace our steps back to Bledington. This is an easy walk on public footpaths and tracks mainly through fields. There is a short stretch of quiet road between Church Westcote and Nether Westcote and one slight incline and decline. Approx 5.6 miles allow 2½ hours using OS Explorer Map OL45, The Cotswolds. Start point: Bledington village green. Bledington is near Stow-on-the-Wold, in the Cotswolds, Gloucestershire. From the M40 take junction 15 then take the A429 to Moreton-on-Marsh and Stow-on-the-Wold. At the traffic lights at Stow turn left onto the A436. After about a mile turn right onto the B4450 for just over 6 miles to Bledington. Parking: Free road side parking.